Three years ago, I walked the Camino de Santiago, or The Way of Saint James, as a pilgrimage to the Catedral de Santiago in Santiago de Compostela in northwestern Spain. There are many pilgrimage routes to Santiago, but the most popular one, and the one I took, was called the Camino Francés (or French Way). I walked the Camino with 3 companions, Bill from Atlanta, Georgia, and Carl and Larry from my parish of St. Stephen Catholic in Old Hickory, Tennessee. 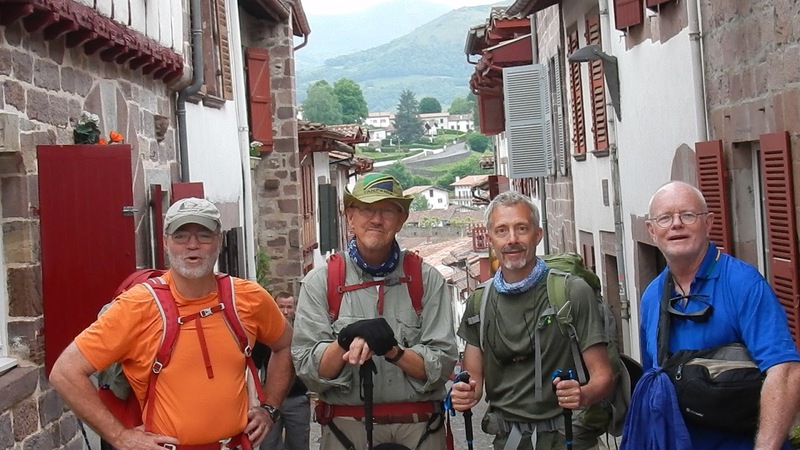 In total, our group of 4 peregrinos (pilgrims) each walked about 500 miles across northern Spain from St. Jean Pied du Port, France, to Santiago. The Camino de Santiago is one of the most popular pilgrimage routes in the world, and has been in existence since about the 11th century. It is believed that the remains of The Apostle Saint James are buried in Santiago, having been discovered there by a traveling monk in the 9th century. There is much written about the Camino, and most everyone has their own individual experience and memories of their journey. One of the better commentaries that I have read in the last couple of years was an article, Walking the Way, by Michael George in the May 2015 issue of National Geographic magazine, It gives a good overall sense of the Camino experience, and the people that call themselves “peregrinos”. And of course, there are good movies about the Camino. Two of my favorites include The Way, starring Martin Sheen and his son Emilio Estevez, and Walking the Camino: Six Ways to Santiago, a documentary film. Watch The Way for inspiration, and Walking the Camino for a bit of a reality check if you’re thinking about walking the Camino yourself. Take care of your feet! Daily! Your real Camino begins when you arrive in Santiago. So, with this blog, I hope to share with you some of my reflections on the Camino, as well as photos taken along The Way. You can view a Prezi presentation of our pilgrimage here.